The Old Quarter is probably the most lively part of the city. It is a maze of streets and small alleys and although it is also called the quarter of the 36 streets, there are several more. Each one of them is named after the goods which were originally produced and sold there, so for example the Hang (which means street) Tre (for Bamboo), Hang Ga (chicken street), Hang Gai (silk street) et cetera. 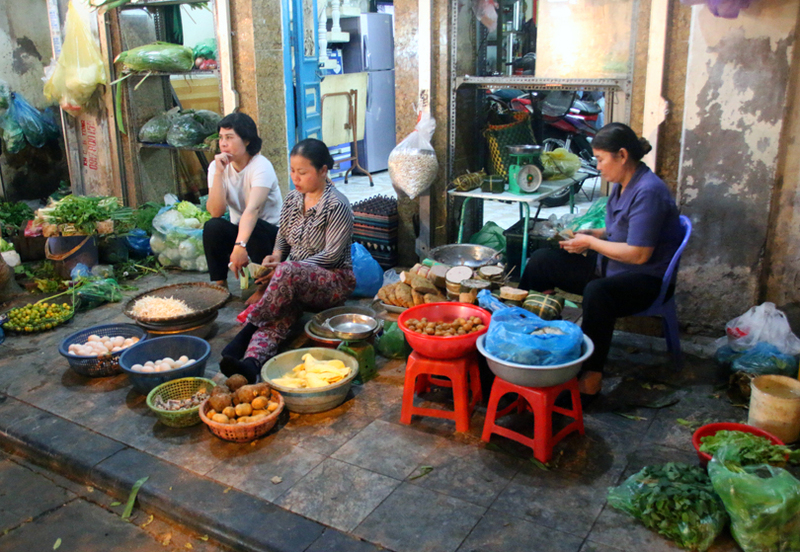 There are many food stalls and street vendors and during the weekends there is also a night market located in the Hang Ngang (transversal street) and in the Hang Dao (silk dyers) which is opened in the evenings. I would highly recommend to take a tour with a cycle rickshaw through this bustling part of the city. Also don’t miss to try a delicious “Pho Ga” (vietnamese Chicken Noodle soup) which is served almost everywhere in Vietnam. Located in the neighbourhood, just a stone’s throw away from the Old Quarter, the 700 metres long Hoan Kiem Lake with the Turtle Tower on an island near the southern end and the Temple of the Jade Mountain (Ngoc Son) on another island near the northern end of the lake is a wonderful oasis. The Temple of the Jade Mountain can be be achieved over the The Huc Bridge. In the early morning between 6 and 7 AM you can watch local residents exercising or doing traditional t’ai chi on the shore, but you can also surround the lake on a walk at all times of the day. Also worth a visit is the Water Puppet Theatre “Thang Long” which is located in the North between the Lake and the Old Quarter. 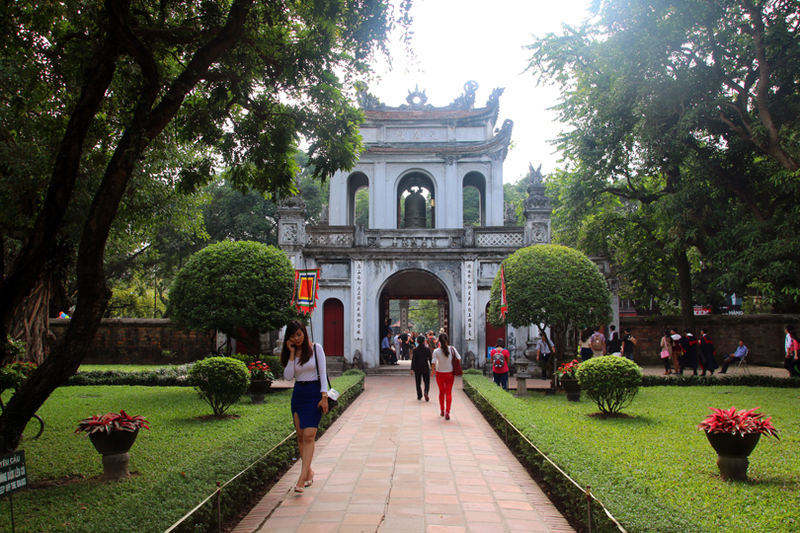 The Temple of Literature aka Van Mieu is a Temple complex which was built in 1070 and was Vietnam’s first National Academy where the sons of the Mandarins and the Highflyers of the country where taught between 1076 and 1915. The complex itself is divided into five courtyards. Most significant are the 82 Stelae of Doctors with the engraved names, dates of birth and the results of the exams of 1307 candidates which are part of the UNESCO’s Memory of the World Programme and are located in the third courtyard. Each one of the steles stand on the back of a stone turtle; 34 steles do not exist anymore. Also very significant is the Confucius statue which is located in the fourth courtyard. After visiting the Temple of Literature I highly suggest to dine at KOTO‘s, a non profit organisation which educates vietnamese street kids. The restaurant is located in close proximity to the Temple of Literature and also offers cooking classes. I am not getting sponsored by KOTO’s in Hanoi. I just love their food and the idea of supporting a good cause. This post is my part of the campaign created by Accorhotels.com – A Tale of three Cities for a contest they have been hosting for the past few weeks. This post brings back such amazing memories from Hanoi. Not the best city I’ve been to in Vietnam, but still worth exploring. The iced coffee was the best there though! Yeah, the iced coffee in Hanoi is excellent, but I also adore the northern vietnamese Chicken Pho. During my most recent visit I liked Hanoi a lot more than I thought that I would and I definitely want to return for a more extensive photo tour especially through the Old Quarter and along the shores of the Hoan Kiem Lake. 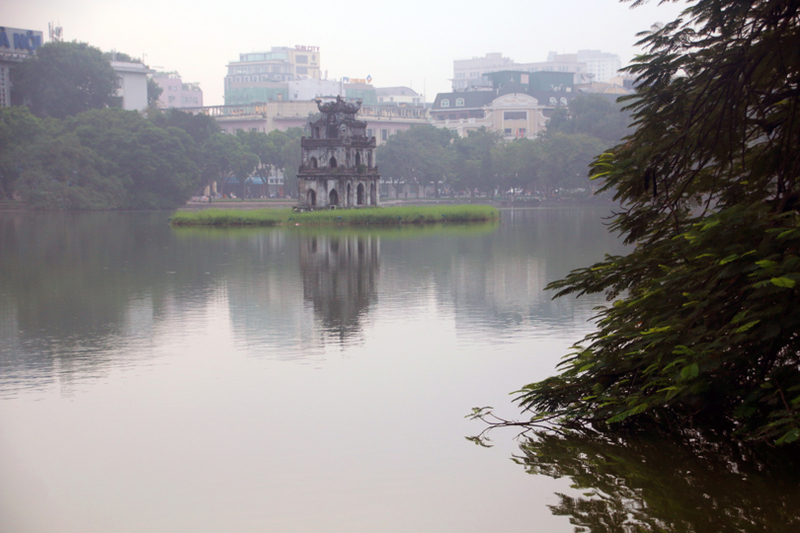 Many thanks Vanessa for your so interesting article about Hanoi! I were there so many times but some on your tips i just never came across! I love Hanoi and i found it is very lively charming. Its cuisine you will never forget! Many thanks for your authentic experiences shared! Thank you so much for your kind words, Lap. 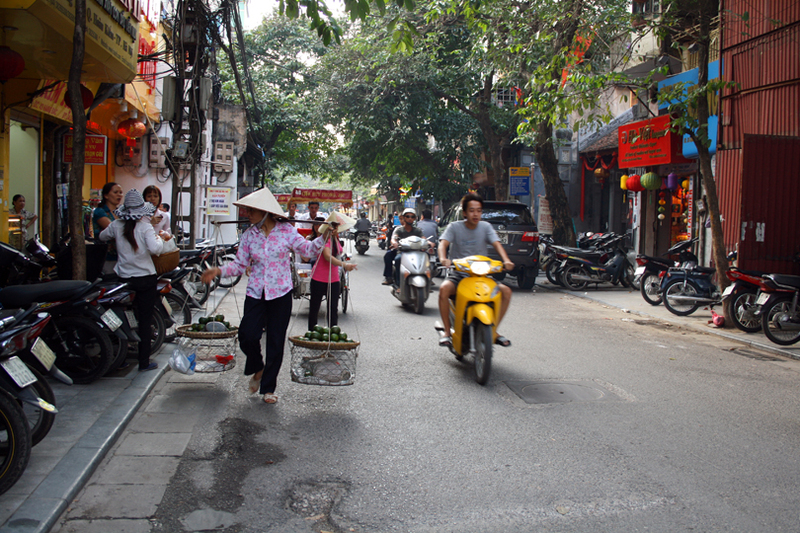 I fell in love with Hanoi as well and I have become a huge fan of vietnamese cuisine. Thanks to you we had the chance to see, explore experience and taste so much of Vietnam and we could not have wished for a better guide. I am definitely intending to return in the (near) future and I hope to see you again when coming back. Great post! The only thing I would add to the list is the Vietnam Military History Museum, but that’s if you like this kind of stuff. They have really nice exhibitions of the military equipment used in a few of their wars / revolutions. Thank you so much for the tip and for stopping by, Cez. We have been to the Hỏa Lò Prison in Hanoi and War Remnants Museum in Ho Chi Minh City, but we missed to visit the Vietnam Military History Museum. 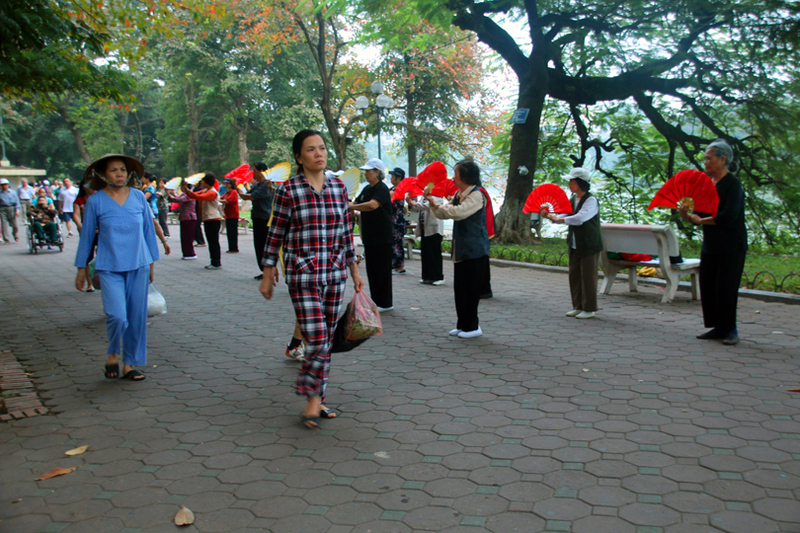 I will put it on the list of things to do when revisiting Hanoi. Before I read this post, I was only aware about Tower of Hanoi problem from my computer science graduation. I am really thankful to you for such a insightful post. Like you, I also make sure to capture the city in early morning. Its so different, original and not touristic. If you visit Venice sometime, try it too in the morning. You will love its still waters. I love capturing places at dawn. When you are lucky with the weather, the light is fantastic and the atmosphere very special. I have been to Venice twice, but only for day trips from other places in Northern Itlay. I will definitely make sure to overnight there next time for some early morning photos. Thank you so much for the tip and for stopping by, Pooja.